The first winner of the Giro d’Italia (1909) was Luigi Ganna. Winners from 12 countries: Italy (68 wins), Belgium (7 wins), France (6 wins), Spain, Switzerland and Russia (3 wins), Luxembourg (2 wins), Colombia, USA, Sweden, Ireland, Canada (1 win). Most stage wins: 42 (Mario Cipollini). The Italian sprinter only just managed to pass Alfredo Binda’s 41, but the pair is a long way ahead of third placed Learco Guerra’s 31. Most days in maglia rosa: Eddy Merckx (79 stages), with Alfredo Binda having worn the pink jersey on 61 occasions. The first crash: 1909 – the Giro wasn’t even two kilometers old before the first mass crash occurred. A little girl stepped into the road, bringing down a group of riders. 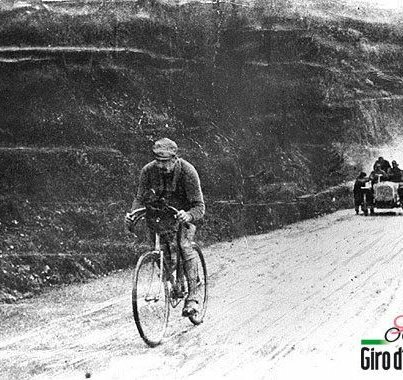 The longest breakaway: 1914 – in the 430 km fourth stage from Lucca to Rome (the longest stage in Giro history), 24-year-old Lauro Bordin broke away and rode an insane 350 km alone – 14 hour solo effort. The bunch caught him 80 km from the finish. The longest successful breakaway: 1976 – 11th stage, Antonio Menendez. A name many will never have heard, the Spanish rider rode off the front at the start of the 222-kilometer-long stage from Terni to Gabicce Mare, and wasn’t seen by another rider again until they met him at the finish line. Menendez won the stage in 5hr 35min 47sec, and 12min 47sec ahead of the second finisher, Rik van Linden. The first individual time trial: 1933 – Alfredo Binda won the 62-kilometer trip from Bologna to Ferrara. Longest stage: 430 km. 1914, stage 4 – from Lucca to Rome. The Maglia rosa, leaders’ pink jersey, has been awarded since the 1931 edition. The jersey’s colour is derived from the pink pages of sponsor La Gazzetta dello Sport. The narrowest winning margin: in 1948, just 11 seconds separated race winner Fiorenzo Magni and the second finisher Ezio Cecchi. The youngest winner: Fausto Coppi (1940), 20 years, eight months and 25 days. Most stage wins in a single event: Alfredo Binda (12 victories out of the 15 stages in 1927). The Giro has been led from start to finish on four occasions: Costante Girardengo was the first in 1919 followed by Alfredo Binda in 1927. Nearly half a century would pass before Eddy Merckx repeated the feat in 1973 and then Gianni Bugno became the latest in 1990. Climber: “Gran Premio della Montagna” (GPM) was made a seprate classification in 1933, The leader in the GPM started wearing a green jersey in 1974. The jersey color is blue since 2012, because the classification’s sponsor, Banca Mediolanum, uses blue as its corporate color. 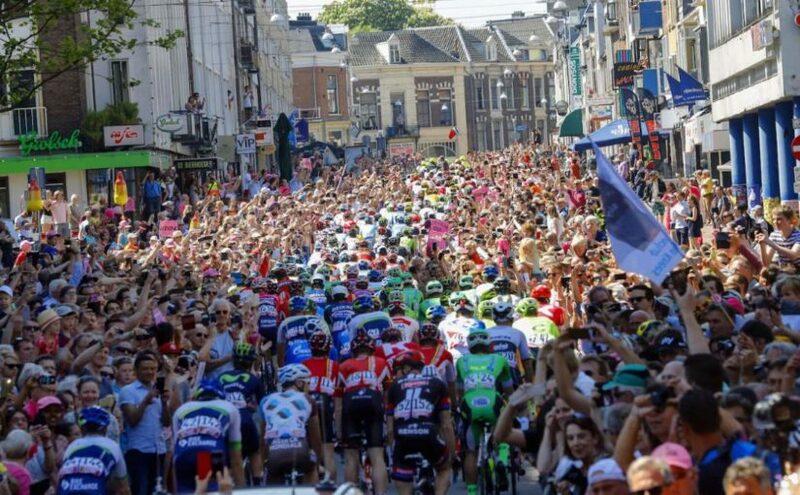 Points: The first two editions of the Giro were determined by points (adding up placings – read the article titled The hidden winner of two Giri d’Italia). A separate points classification was established in 1966 (though there is a points result for 1958) and the next two years the leader in the points classification was given a red jersey. From 1969 to 2009 it was purple (cyclamen, to be exact) and in 2010 it became red again. Young Rider: Awarded to the rider with the best General Classication time who had not reached his 25th birthday by January 1. While there was a Young Rider classification in the 1930s, the category got its offical start in 1976. From 1995 to 2006 there was no young rider prize. Team: Currently calculated by adding up the times of the three best riders of each team per stage. There was a black jersey (maglia nera) between 1496 and 1951: it was awarded as a symbolic prize given to the last man to finish the race within the time limit. By 1912 Italy was at war with the Ottoman Empire. Using, for the first time in military history, aerial bombs, the country all but bankrupted itself in wresting control of Libya. The Gazzetta (Giro organizer) formulated a plan which it hoped would enable the peninsula’s soldiery to compete. A great many cyclists had found themselves conscripted to the Bersaglieri and the Giro, patriotic to the last, thought it a good idea to give them a morale boost. They settled on a team classification, each squad comprising four riders, the first three of whom would count towards the general classification. (Sykes, Herbie. Maglia Rosa – Triumph and tragedy at the Giro d’Italia. London: Rouleur Limited, 2011) Team Atala (Luigi Ganna, Carlo Galetti, Giovanni Micheletto and Eberardo Pavesi) won the 1912 Giro.